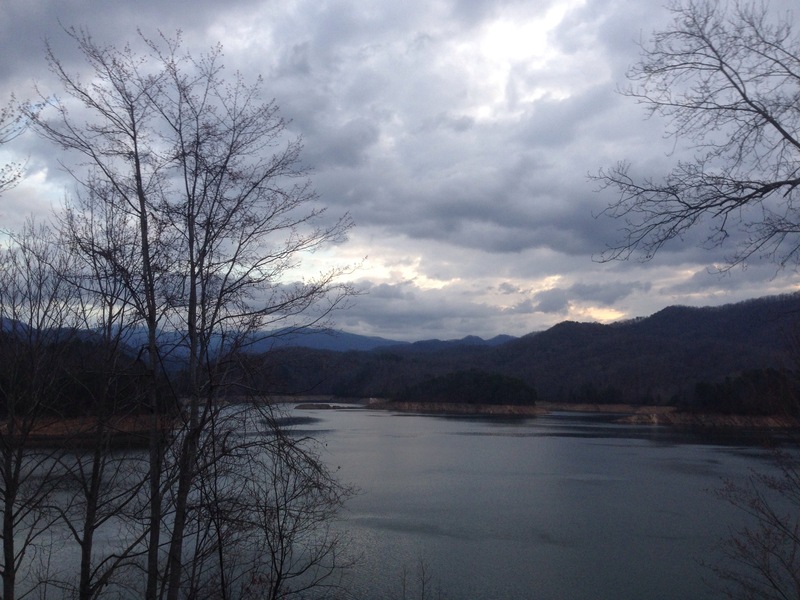 Day 17 was an uneventful 11.3 setting us up for our first nearo (near zero) day at Fontana Dam. Day 18 we got going 8:30ish (early for us so far) and went down the last 3.6 miles to the Remarkable Bathroom, remarkable because: it had A) toilet paper, B) hot water, C) 4 open electrical outlets, and D) a phone that summoned a shuttle to the Fontana Resort. I called for a shuttle, operated the toilet, took half a roll of paper, bandana-showered in the sink, and charged my phone and iPod. A great day already. A guy in a van eventually pulled up and we rode a couple miles to the resort campus. Nothing too special there, just a few buildings around a grassy commons with a mini-golf course. We bought some fatty snacks at the general store and sat around sipping free coffee and charging our phones on the porch. Kyle wanted this time to research jobs and boats and I wanted it to send emails to lots of people. Kyle fantasized about buying a cheap boat and living on it for a year, drifting from port-to-port, playing music gigs in seaside bars. Living on the trail with so little opens your mind to dreaming like that. When you can sleep in a bag and cook on a pocket-stove, the world is full of possibility. 2-4:00, however, a scheduled power outage revoked our wifi (the gall!) so we walked down to a gas station/motorcyclists’-tourist-trap to continue charging while snacking on nachos and hot dogs and beer. After 4:00 the power returned and we resupplied. Before we knew it 6:00 had passed with the last shuttle, so we trekked along a winding road, admiring the golden sun on the silent trees, back to the Remarkable Bathroom. We knew about a mile along the AT we would find a renowned shelter, the “Fontana Hilton,” but Kyle’s phone—with its immense and bottomless battery—was not yet charged, and we had some beers, so we set up, once again, at the Remarkable Bathroom, watching dusk approach. Just then an ample and rumbling hiker huffed up the hill from the docks and sat on the bathroom stoop. This was Big Country, and he informed us that the bait shop sold the cheapest beer in town, though it was closed, and the shopkeep remembered him from his thru-hike attempt last year, and that they had chairs and wifi on the dock after hours. Sounded good to us. Big Country’s friend Grizzly arrived as well; we left the two chatting and made for the docks. Somehow, after all the boat-dreams that day, we found ourselves sipping beer in lawn chairs on a sleepy marina while the sun set. The reservoir lapped at the boats in their berths. Eventually we returned, once again and now in darkness, to the Remarkable Bathroom. We plugged in our phones, Kyle’s still not full. But then we saw Grizzly returning from the direction of the shelter. Apparently he had been following Big Country on the AT when for some reason he thought the shelter might not be that way, so he turned back. Though we told him we’d be charging for a while, he sat down and said he’d just follow us to the shelter. And so we sat. We talked about the Smokey Mountains before us, the permits required, and the numerous black bears we both did and did not wish to see. Eventually we gave up on Kyle’s full charge and walked the mile to the Hilton. Grizzly followed gradually behind. Voices and a bonfire sprung from the dark; Grizzly admitted that he may not have walked far enough (???). Approaching the bonfire we were presented with the dregs of a handle of tequila and cold chicken legs roasted on the fire. Apparently we’d caught the end of some riotous trail magic. The fire blazed. People laughed. Johnny Cash sang from a phone. A guy told me about Maine politics and his state of inebriation interspersed for twenty minutes. The shelter was full and tents were everywhere; hikers seemed to get caught up here delaying the Smokies and enjoying free hot showers in the Yet More Remarkable Bathroom nearby (hence “Hilton”). We slept tentless in our bags against a railing overlooking another lake.